Tombstone Tuesday is one of the many blogging prompts supported by www.geneabloggers.com to help genealogy bloggers record their family histories. 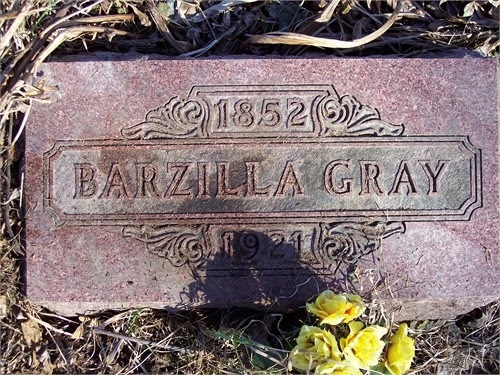 Barzilla Gray, well known and highly esteemed resident of the town of Scott, died Wednesday, March 14th. Deceased was born in Ohio, March 18, 1852, coming with his parents to Richland county in 1863. In 1872 they moved to Iowa, returning to Wisconsin in 1876. July 21, 1878, Mr. Gray was united in marriage to Mary Pickett. They settled on the present homestead in 1882, where they have since resided. To them were born six children, 2 sons and 4 daughters: Mrs. Judson Wilkinson and Mrs. J.W. McDaniel of Scott, Frank of New England, N.D., Floyd and Lura at home and Mrs. Will Elliott, deceased. The wife and 5 grandchildren, with the above, survive. Deceased united with the M. E. church and was baptized 43 years ago. In failing health, Mr. Gray was taken to Parker hospital in Boscobel Feb. 24 last. For a period he continued to improve and hopes were entertained for his ultimate recovery, but unlooked for complications set in and the final summons came unexpectedly. Mr. Gray was the last one of his family. Deceased was an excellent man and worth citizen, respected by the entire community. In the home he will be mourned as a loving husband and devoted father. Funeral services were conducted by Rev. Ernest Jeffrey, Friday, March 18th, from the home and remains were laid to rest in the beautiful cemetery at Mt. Zion. We desire to thank neighbors and friends for numerous acts of kindness and sympathy during the illness and death of our beloved husband and father. This is transcribed from a scanned copy of an original newspaper printing of Barzilla's obituary on Ancestry.com. The newspaper or publication date was not included in the image or supporting text. 1) Determine how complete your genealogy research is. For background, read Crista Cowan's post Family History All Done? What’s Your Number? and Kris Stewart's What Is Your Genealogy "Score?" 2) Create a table similar to Crista's second table, and fill it in however you can (you could create an Ahnentafel (Ancestor Name) list and count the number in each generation, or use some other method). Tell us how you calculated the numbers. 3) Show us your table, and calculate your "Ancestral Score" - what is your percentage of known names to possible names (1,023 for 10 generations). I used my online family tree at Ancestry.com and manually counted the number of ancestors for which I have documented a first and/or last name. I then created the following chart in Microsoft Excel and used the built-in formulas to calculate my "ancestor score." I have hidden a few of the columns in the image below for ease of viewing. Unlike Randy and many of the others participating in this edition of SNGF, my sourced tree only goes back 8 generations (my 5x great-grandparents). As you can tell in the table above, my "Ancestor Score" for 8 generations is 28 percent and I was actually surprised that it was as high as that! I have spent the majority of my research time over the past few years concentrating on documenting the connections that my family has "collected" over the years. I'm finally starting to make my way back through my great-grandparents and have a 100% score through my 2x great-grandparents. I was very happy with my scores of 84 percent for my 3x great-grandparents and 52 percent for my 4x great-grandparents. I still have quite a bit of work to do in researching my family tree. One of my research goals for 2014 is document two additional 3x great-grandparents, which will bring my 6th generation "Ancestor Score" up to 87 percent.